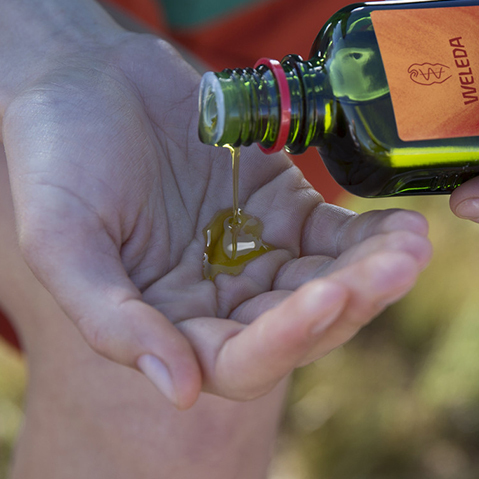 Weleda’s Arnica Bumps & Bruises Skin Salve is handy for the family first aid kit - immediate application will help prevent the development of bruising. Manufactured here in Britain, it’s made with organic arnica tincture from fresh whole plants grown biodynamically in the Scottish Black Isle, where the extreme cold and intensity of light are ideal for this alpine plant. The natural base contains the finest lanolin, sunflower oil, olive oil and unbleached beeswax, so this salve absorbs more slowly than a water-based cream, to allow for gentle massaging. But the top quality ingredients can be absorbed by the skin and won’t leave a sticky, greasy residue which is a common problem with paraffin-base ointments. So what makes some of us bruise more easily than others? It is an inconvenient fact that women bruise more easily than men. This is most noticeable on legs, buttocks and upper arms. This is because women’s skin is thinner, and the fat and blood vessels are organized a little differently to men. The dense collagen layer is thicker in men and the blood vessels nestled more securely. In addition to being female, bruising results more often if your skin has thinned from sun damage. Skin also thins as it ages, and an increased tendency to bruise is a common part of the ageing process. As we age the walls of the capillaries in our skin become thinner, allowing them to burst more easily. The skin loses fat and provides less cushioning. A tendency to bruise easily can also run in families. Being very fair skinned does not help since bruising looks more noticeable on pale skin. Certain medications can contribute to bruising, for example, steroids - often taken to help asthma or arthritis for example. Similarly, aspirin (and other drugs sometimes used to prevent heart attacks and strokes) can interfere with the blood's clotting mechanisms, increasing the risk of bruising. Heavy drinkers also have an increased tendency to bruise badly - alcohol also has a blood thinning effect. And of course, alcohol also makes you clumsy and more prone to minor injuries in the first place! A bruise appears when you injure a superficial blood vessel and blood leaks into the tissues just beneath the surface. The leaked blood appears as blue-black through the skin. The size of the bruise depends on how much blood leaked out before a clot formed to stop the bleeding - the larger the vessel damaged or the longer it takes for your blood to clot, the larger the bruise will be. So if you whack your previously pristine shin on the coffee table, what can you can do to minimize the bruising and swelling? Apply ice for 10 to 20 minutes. This slows the blood flow and minimizes the amount of blood leaking into the skin. Keep the leg elevated. This also minimizes the effect that gravity has on pooling blood in your legs. Administer Arnica which is a natural anti-inflammatory that is highly effective on bruises, soothing the pain and helping to prevent deep discolouration. Alternatively, Arnica Massage Balm is ideal for large bruised areas as this fine body oil can be applied gently to the skin, to ease inflammation and soothe the stiffness that often accompanies bruising.